I often write about the exhilaration I feel when one good book leads to another and another. 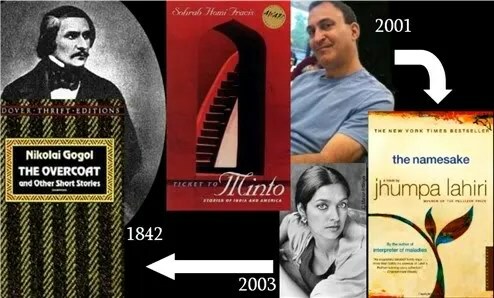 After reading and enjoying Ticket to Minto, I interviewed the author, Sohrab Homi Fracis. He mentioned that he was pitching his novel-in-progress as “Jack Kerouac’s On the Road meets Jhumpa Lahiri’s The Namesake.” This piqued my interest in The Namesake. I picked it up at the public library and I must say, it’s a very good book. The main character is a young man who does not appreciate the fact that his parents named him Gogol, after the writer, Nikolai Gogol. Only later does he find out the full story behind his name. But we won’t go into that now. The book begins with a quote from Gogol’s short story, “The Overcoat.” Now I’m reading a collection of stories by Gogol on my iPhone, which I got from Kindle for only a couple of dollars. What a deal! Gogol is so cool that Vladimir Nabokov wrote a book about him, and that says a lot.